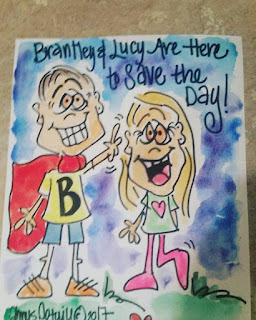 A special request came to me from Rob Keisacker of Sioux Falls, SD, to make Brantley Dobbs, his own Super Hero painting of him and his sister Lucy. Brantley has a brain tumor and is in Hospice at home. This is an 8" x 10" watercolor painting on watercolor paper. He has a facebook group page called Brantley's Christmas Cheer. Type that into a search box on facebook to find all about Brantley or click on the link and it will take you there directly.